He took a deep breath picked up his suitcase and, walking quickly, despite not knowing where to go, like so many others, he stepped into the magical music box called America.a— Henry Lehman, leading us into the story of his and his two brothers' journey from Bavaria to America, from store keepers to "merchants of money" whose giant organization was deemed "too big to fail" — and did. It would take a huge cast and countless location shots to make a movie about the three Lehman brothers who founded a financial empire that had its roots in a humble little store in Montgomery, Alabama. Lucky for theatergoers in London and currently at a New York's Armory, The Lehman Trilogy brings together just such a combination of extraordinary talent: A script, originally a 5-hour long radio drama, beautifully translated and adapted by Ben Power, brilliantly staged by Sam Mendes,and sublimely performed by three incredibly versatile actors— Simon Russell Beale, Adam Godley and Ben Miles. Besides detailing how three Jewish immigrants invented new ways to make money from the cotton that was gold currency in their new Southern home. But as the brothers' inventive entrepreneurship also serves as a century and a half spanning history of capitalism-- how money itself became the product used to drive the modern economy. The curtain at the Armory's imposing Drill Hall rises on a brief prologue. It's 2008 and this, our first glimpse of Es Devlin's stunning, constantly rotating glass box set, takes us to an office where a shadowy figure is packing up and carrying out boxes, as a voice-over explains that the financial meltdown that almost caused another great depression, resulted in the bankruptcy of the "too big to fail" Lehman bank. While the bank still carried the Lehman name in 2008, no Lehman family members were associated with this financial empire since 1969. Nevertheless, this trilogy is still aptly named for and focused on the Lehman Brothers since they and several generations of their offspring have had a lasting impact on our constantly evolving social and economic zeitgeist. That includes the inventive, smart things they did to realize the get rich aspect of the American Dream (a phrase years away from common usage when the Lehmans first joined the great wave of immigration in America). But it also pertains to the troublesome aspects of their evolution as "merchants of money"— with money, as Emanuel's son Philip, at one point defines as the flour of their recipe for using money to make money. And so the three acts that follow that brief prologue cover the brothers' journey from Bavaria to Montgomery, Alabama, from small storekeepers, to ground breaking financiers, husbands and fathers, strictly observant Jews to being assimilated modern Americans attending Reformed Jewish synagogues, and raising their children to fit into that world but also expecting enough of them to carry on what Henry, Emanuel and Mayer began. If this sounds a bit like a familiar story combined with an economics lesson, it is. But it's a lesson that's so vibrantly and uniquely presented that for anyone lucky enough to nab a ticket The Lehman Trilogy is likely to be their most memorable theater experience this season. It's certainly a highlight of my season. There isn't a participant in this extraordinary production who doesn't deserve a standing ovation. Ben Power's adaptation of Stefano Massino's script is indeed so powerful that you could just close your eyes and savor the richness of the language. But of course then you'd miss seeing the bravura performances of Beale, Godley and Miles. Their clear as a bell delivery and the way they segue between their main characters and the many others who are part of their personal and professional story (including children and women) will make it easy to overlook that they don't exactly exemplify color blind casting. Then there's the the masterful direction by Sam Mendes that keeps this multi-faceted saga moving forward without a dull moment. 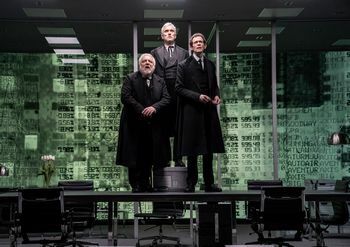 Es Devlin's constantly rotating set effectively supports the actors' moves from one phase in their live, dressed throughout in the long black coats provided by costumer Katrina Lindsay. Video designer Lucas Hall further enriches the changing events they narrate and enact enhance with a panorama of projected background images, evocatively lit by Jon Clark. Not to be overlooked in tallying up the play's pleasures is Nick Powell's terrific original score, played live on an upright piano at the foot of the stage. Bravo to the alternating pianists, Candida Caldicot and Gillian Berkowitz. While the Lehman brothers didn't condemn slavery, neither did they seem to have strong opinions against it. With their eye always on their enterprise's survival, both managed to survive the Civil war and prosper in its aftermath (Mayer in Montgomery, Emanuel in New York). While Henry died prematurely of yellow fever, the two brothers survived and prospered as investors in coffee, railroads and members of the New York Stock Exchange. Once the other founding brothers die (Mayer in 1897, Emanuel in 1907), the actors continue the saga as narrators of events that follow by stepping into the personas of the Lehman heirs (First Emanuel's motor-mouthed and most dedicated merchant of money Philip, then Philip' son Bobby who wants to link business with pleasure and the pleasure producing world). Though Mayer's son Herbert (portrayed by Ben Miles) is the play's voice for the American Dream defined not by financial success but living a meaningful life in a just and equal society. He did join the business for a while, he did eventually leave for a life more compatible with that definition, for eight years s New York's governor and after that as its representative in the senate. One of the play's many funny interchanges has Miles as a young Emanuel arguing with Beale's crotchety rabbi about his sisters' bat mitzvahs not being treated with the respect of his bar mitzvah. From 3/22/19; opening 3/27/19; closing 4/20/19.